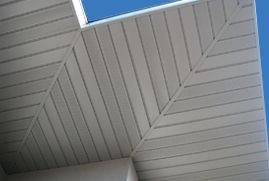 Rollex is our stock brand of aluminum soffit material. Snowmist is our most common selling color. We have many snowmist items in stock and should have a few sticks of almost any other colored Rollex item in stock. If we don't have a product, however, it only takes a day or two to get. Give us a call or send an email with any questions.